- New cards used by Mai and Bakura in the original series, including the often-requested Diabound Kernel (card name subject to change) from Bakura’s Duel against Kaiba. - The power to unleash any of the Sacred Beasts from Yu-Gi-Oh! GX in any Deck and draw an extra 2 cards per turn if you do! - Yusei’s secret ace Synchro Monster whose existence was revealed in Yu-Gi-Oh! 5D’s, but was never called to action in our timeline. - The terrifying influence of Don Thousand, the ultimate foe from Yu-Gi-Oh! ZEXAL! - Perform death-defying Dueling feats and get rewarded with extra draws every time you do with a card that brings the excitement of Yuya’s “Dueltainer” style of Dueling from Yu-Gi-Oh! ARC-V.
- Brand new “attack” Spells! Spells like Dark Magic Attack that represent the signature moves of famous monsters have always been a hit with fans, and more are on the way in Duelist Saga covering monsters from every series. Duelist Saga also has 60 more cards that span the entirety of Yu-Gi-Oh!’s history, featuring memorable cards from the various series, the tournament scene from each era of Yu-Gi-Oh!, and sometimes both! 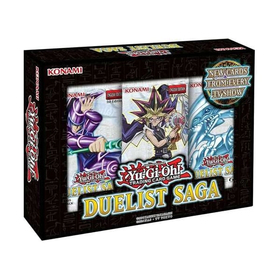 Each Duelist Saga box contains 3 mini-packs with 5 cards each, for a total of 15 cards. Appearing for the first time in Duelist Saga, all cards in the set use an all-new, all-different Ultra Rare technology, and each mini-pack will contain 3 of the 40 new cards and 2 of the classic cards for a total of 15 cards per box: 9 new, and 6 classic! The Duelist Saga complete set contains 100 Ultra Rare cards.